Three months until the start of Panamerica Solo and it is time to increase the training. Of course the ideal training would be at home but traveling by bicycle is just so much more fun and keeps me motivated, the far most important part of an unsupported long distance world record. Moreover, I now have the time to explore North America, something that comes a bit short when I'm pushing for the record in August. 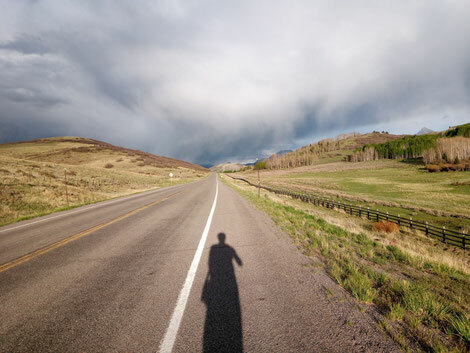 I arrived in Las Vegas in early May to cycle 15.000 km North to Alaska, not the direct route though but a scenic detour across most national parks of Western North America. I directly start in the Mojave desert and already suffer from 40 degrees, no shaddow and big distances between water sources. The road goes endless straight and the wind pushes merciless from the front - good mental training. At night when the sun sets the desert turns into a paradies with clear skies and no other people anywhere close. I make a campfire and sleep next to it although I had seen a rattlesnake earlier the day. Just couldn't resist the temptation of sleeping under the stars. The next day I already reached Utah, the land of the Canyon's. My first loop went into Zion national Park, a valley with massive cliffs and stunning scenery. I take half a day off from the bike and hike deep into the canyon "the narrows" before climbing up to the viewing point "Angel's Landing". Back on the road it's only a day trip to Grand Canyon in Arizona. Luckily the road to the northern rim is still in winter closure. No problem for a cyclist though and I had the whole canyon just for myself before the turist crowds come a week later. I rode back into Utah and a big 220 km day in the winds later I reached the spectacular Bryce Canyon with it's strange rock formation. I found a spot to sleep just at the rim of the canyon and could watch the sunrise and sunset in the valley next to my camping fire. The little things that I love so much about adventuring. A few days later I reached Moab, a small town directly between two spectacular national parks. I decided to take a day off to explore the area and got invited by a group of locals to join on a rock climbing trip. Feels great to get some change and the next day I head full of anticipation across the border into Colorado. Some very high mountais are a ahead of me.